Dr Sidharth Verma is a reputed pain management specialist practising from Chembur in Mumbai with a career spanning 9 years. 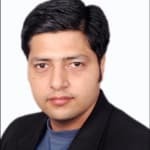 He did his MBBS from ASCOMS in Jammu, then obtained an MD in anesthesiology from the reputed Acharya Shri Chander College of Medical Sciences in Jammu, got a Diplomate of National Board (DNB) in anesthesiology preceding his PDCC in pain management from IMS, BHU in Varanasi. He is a reputed and active member of the Indian Society of Pain Clinicians, International Association for the Study of Pain and the World Institute of Pain. He not only is excellent with arthritis and pain management treatment, regenerative medicine, anesthesia, back pain treatment, chemonucleolysis and chronic pain management he also is an expert when it comes to complex regional pain syndrome treatment and disc prolapse treatment. You can consult Dr Sidharth Verma at Vashi Sector 3, Navi Mumbai where he has a flourishing practice spanning over 9 years, making him one of the most reputed pain management specialists in and around the city. Dr Sidharth Verma is a professional renowned for his ethical practices and post treatment patient care. His treatment style is fact based and patient oriented where he analytically treats the ailments of those approaching him. The precision with which Dr Sidharth Verma deals with his patients has earned him a name in the medical community both in Mumbai and elsewhere. Even though I was fit and fine, but suddenly I started experiencing headache . Dr Sidharth is a well known doctor for pain management . The complete process of headaches treatment was so painless and quick, and i am so relieved that I chose to consult him. Thanks to him that the headaches treatment he gave me has given brilliant results.The lab in the Pain Relief Center was very clean and well managed. I was suffering from migraine. So many doctors I consulted, but Dr Sidharth's treatment was the best. I am so happy with the results of my treatment, that I will surely recommend Dr Sidharth Verma to anyone gladly. My case was extremely serious, but he really handled it very nicely. Hygiene is very important, and I must say that "Pain Relief Center" was extremely clean. It's been more than a year that I was experiencing Meningitis. I consulted Dr Sidharth, he is very courteous and behaves very aptly with elder patients. Everything was just spick and span in the Pain Relief Center. Dr Sidharth Verma is well aware about innovative techniques to treat problems. The overall Meningitis treatment was very effective and quick. The symptoms were severe and unmanageable, as I was suffering from muscle cramps, but Dr Sidharth, i was able to handle it. I am almost my normal self post the treatment and for that he is the reason. I was quite impressed with his concept of holistic healing. During the complete muscle cramps treatment program he always supported and motivated me. Overnite my lower back pain issue aggravated. I found the Pain Relief Center itself quite pleasant. In the past i consulted so many doctors, but nobody was able to help me with my lower back pain, but he has helped me immensely. I am so happy that I chose Dr Sidharth Verma for my treatment as now I am perfectly fine. dr Sidharth verma is very good, cooperative and caring.he gave me a treatment for my Problem of back pain. His staff at his clinic Pain Relief Center inj Chemburis very cooperative. They perform their duties very sincerely and honestly. i am now fully satisfied and happy.